The International Olympic Committee (IOC) has warned National Olympic Committees (NOC) not to trust the contents of a letter sent to International Boxing Association (AIBA) members by the governing body's President Gafur Rakhimov. The letter was sent to the 206 NOCs by IOC director general Christophe De Kepper to provide an update on the recent measures introduced by the organisation with regard to AIBA. It claims the IOC have "read with concern" the contents of a letter from Rakhimov to National Federations. Rakhimov had claimed the governing body was now in a position to confirm it has "finally and fully left the troubled past behind us", following the IOC Executive Board meeting in Tokyo last month, where it was decided that the planning of the Olympic boxing tournament at Tokyo 2020 would be frozen. At its meeting, the IOC Executive Board asked for more information regarding AIBA’s financial situation, another key concern of the IOC, and Rakhimov's own situation with the United States Treasury Department. Rakhimov, described as "one of Uzbekistan's leading criminals" by the Treasury Department, was directly mentioned as a reason behind the troubles faced by AIBA for the first time by the IOC in a statement. Financial management and the integrity of its competitions are among the other areas of concern the IOC has with AIBA. The IOC has also begun an inquiry into AIBA, which could lead to them losing the right to organise the Olympic boxing competition. There is also the possibility a boxing tournament will not take place at Tokyo 2020, but the IOC have insisted they intend to hold a competition, with or without AIBA. NOCs have been invited to contact Olympic Solidarity's athletes' unit to discuss the re-activation of boxing-related activities. De Kepper wrote to the NOCs in an attempt to clarify their decision, warning Rakhimov's letter may have caused "confusion". 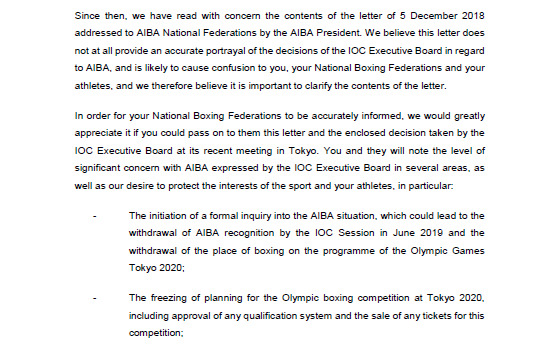 "We believe this letter does not at all provide an accurate portrayal of the decisions of the IOC Executive Board in regard to AIBA, and is likely to cause confusion to you, your National Boxing Federations and your athletes, and we therefore believe it is important to clarify the contents of the letter," De Kepper wrote. "In order for your National Boxing Federations to be accurately informed, we would greatly appreciate it if you could pass on to them this letter and the enclosed decision taken by the IOC Executive Board at its recent meeting in Tokyo. "You and they will note the level of significant concern with AIBA expressed by the IOC Executive Board in several areas, as well as our desire to protect the interests of the sport and your athletes." Rakhimov, elected President against the wishes of the IOC at the AIBA Congress in Moscow last month, made a series of claims in his letter to members. He highlighted that the implementation of good governance systems resulted in the advancement of AIBA in the governance assessment by the Association of Summer Olympic International Federations to a position in the top half of all summer bodies. Rakhimov also points to anti-doping compliancy - resulting in AIBA being World Anti-Doping Agency compliant and collaborating with the new International Testing Agency for all in and out-of-competition testing. The implementation of new refereeing and judging systems that were used at the Buenos Aires 2018 Youth Olympic Games and last month’s AIBA Women’s World Championships in New Delhi were also promoted by the AIBA President. The AIBA President last week hit back at calls for him to resign made by England Boxing by accusing chairman Caspar Hobbs of a "shocking" lack of respect for his fellow members within the governing body. Hobbs claimed the "leadership of the organisation needs to be considered" and that it was time for Rakhimov "personally to think about the actions you can take to help resolve the issues faced by the sport". IOC President Thomas Bach admitted Rakhimov's inability to "exercise his full function" as President of AIBA owing to his inclusion on the US Treasury sanctions list, which prohibits travel to certain countries, was a key concern. Rakhimov has previously hinted he could stand aside if the problems with the IOC continue. The Uzbek official has promised he will not jeopardise boxing's Olympic future but has given no indication that he plans to step down. Rakhimov has repeatedly denied wrongdoing.